Military medals and ribbons signify extraordinary military achievements. This is especially true for the recipients of medals for valor, meritorious achievement, and for injuries sustained during enemy combat. 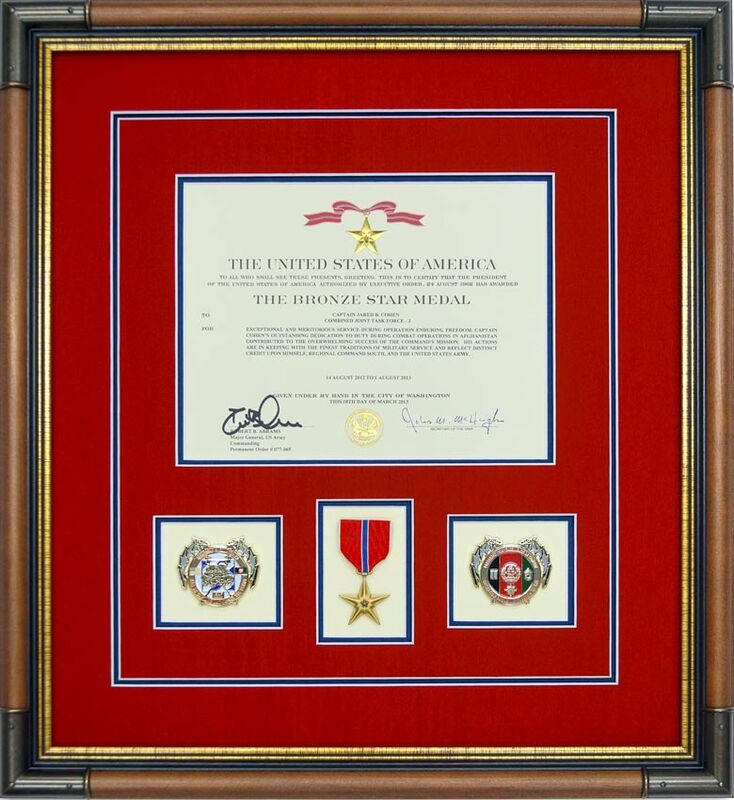 This example features the Bronze Star Medal custom framed with challenge coins. The Bronze Star Medal is awarded for heroism, heroic achievement, and heroic merit. This Bronze Star Medal is framed with the award document over the medal and the challenge coins. The challenge coins flank the medal. This design variation uses triple acid-free/conservation grade mats. The mat colors match the colors in both the Bronze Star Medal and the decoration award. The top mat is a red silken. The red silken mat provides a rich, deep texture to the overall look. The middle silken mat is dark blue and matches the color of the medal’s vertical stripe. The blue also matches the blue in the challenge coins. The Bronze Star and the challenge coins are mounted on an off-white mat in the openings beneath the award document. The award document is mounted on acid-free reversible foamboard. Our signature open V-groove surrounds the award document, the medal, and the coins. A dark brown wood frame with metal corner caps surrounds the mats. This frame with corner caps has proven to be our most popular profile for framing documents with small items such as medals, ribbons, patches, rank pins, distinctive unit insignias, photographs, tabs, patches, and small memorabilia. We frame Bronze Star Medals using conservation grade materials and techniques. This includes using 99% UV protective glass. 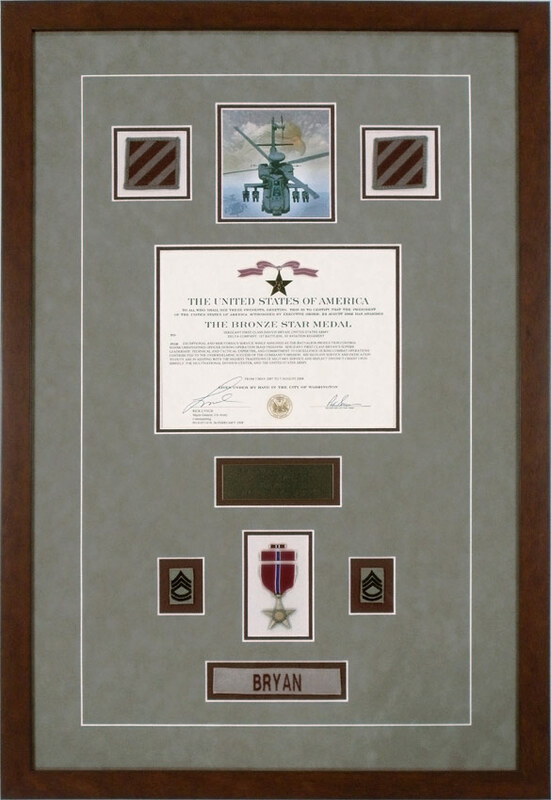 We offer additional options for framing Bronze Star Medals. Some of these options include different mat colors and different style frame profiles. Options are also available that include placing additional objects inside the frame with the Bronze Star. Uncommon valor is just that—it’s uncommon. Uncommon valor is not a trait or skill set that’s learned in school or training. Training and education will build confidence. And confidence does take us to higher levels of achievement. However, uncommon valor goes beyond the self-confidence acquired in training. Uncommon valor results when the desire for self-preservation and personal safety is disregarded in order to gallantly protect or save other people. Within each of us is the desire to survive dangerous situations. To varying degrees we are all wired in some measure to avoid the risk of death or injury. America’s military does not consist of suicide bombers. The U.S. military consists of professionals who do their duty honorably with the desire to return to their families. However, members of the U.S. military do possess heroism. In the face of danger, heroic servicemen and women disregard concerns for their personal well-being. In an instant, they flip the psychological switch between personal safety and the desire to save their brothers or sisters in arms. If they’re lucky, their actions save lives and they go unscathed. If they’re not lucky, they either lose their life or they are injured. We believe medals for valor, meritorious service, and injuries sustained in combat should be preserved and framed in a respectful and meaningful way. Military medals are heirlooms that need to be protected and safeguarded. 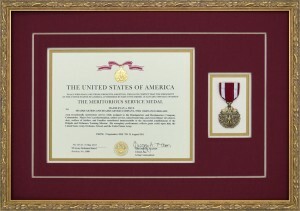 This is an example of the Meritorious Service Medal custom framed with the signed award document. The Meritorious Service Medal with the award were framed together in a narrow, ornate gold-tone frame. The Meritorious Service Medal is framed with a design that uses quadruple acid-free/conservation grade mats. The mat colors match the colors in both the metal and the award. The top mat is red linen–which provides a rich textured look. An off-white middle mat produces a distinct color contrast. The third mat is a gold to match the seal and gold in the medal. The medal is mounted to an off-white bottom mat. The award document is mounted to an acid-free reversible “release” foamboard. An open V-groove surrounds the award document and the medal and separates them from the frame. Custom framing military medals and ribbons is one of our specialties. We frame the meritorious service medal using conservation grade materials and techniques. This includes using 99% UV protective glass. 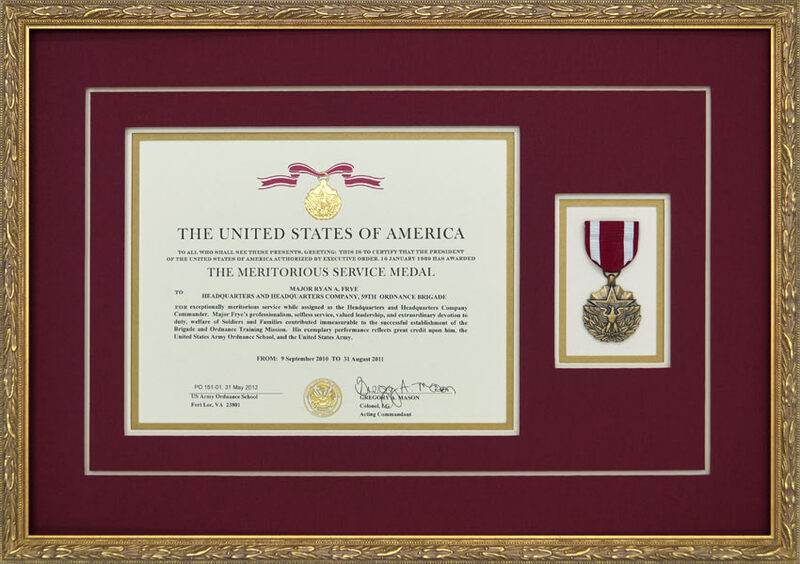 There are a number of options available for framing the meritorious service medal. Some of these options include different mat colors and different style frame profiles. Options are also available that include placing additional objects inside the frame with the medal. US Military members receive meritorious service medals after distinguishing themselves by performing outstanding meritorious accomplishments. Receipt of a meritorious service medal is a very positive reflection on the honor and perseverance of the recipient. The recipient is recognized by the award of this medal and a certificate acknowledging their service. We believe that meritorious service medals should be framed. Custom picture framing designs that incorporate both the award certificate for the decoration, and the medal, are something we routinely frame. Some customers have these medals framed in military shadow boxes or in with flag displays. Other customers often have the medal and the certificate framed together with other military memorabilia. The US military medal for recognizing a soldier’s injury in the face of enemy combat is the Purple Heart. We frame the Purple Heart Medal using different designs and design elements to reflect the individuality of the medal’s recipient. This is an example of a custom framed Purple Heart Medal. It includes the signed award document stating the medal was received for wounds sustained in action. 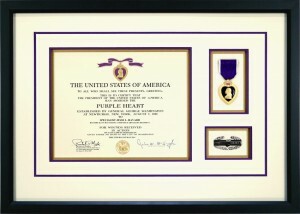 The Purple Heart Metal is framed with the citation document and a Combat Action Badge. The display design for this medal uses quadruple acid-free/conservation grade mats. The top mat is an off-white linen textured mat. The medal and the Combat Action Badge are mounted to an off-white linen bottom mat. The middle mat is purple and forms a pronounced color contrast around the items in the frame. The third mat is a gold to match the seal and gold in the medal. The award document is mounted to an acid-free “release” reversible foamboard. This permits the document to be removed at a later date without damage. An open V-groove separates the document and the objects from the medal. The open V-groove also provides symmetry to the design. The Purple Heart Medal was framed using conservation grade materials and techniques—including 99% UV protective glass. 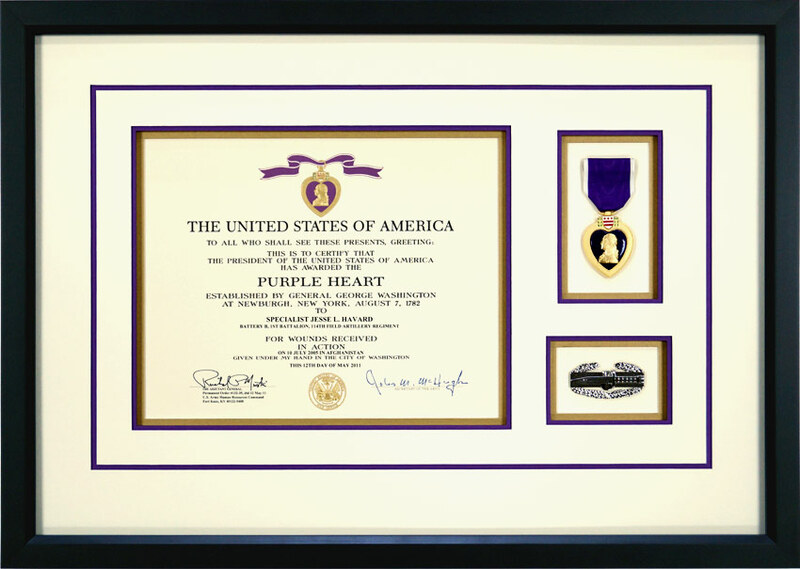 As custom picture framers, we offer a number of options for framing the Purple Heart Medal. Some of these framing options include using different mat colors with different style frame profiles—such as acid-free suedes or paper mats. Additional framing options include the placement of other memorabilia items inside the frame with the medal. Framing US military medals and ribbons awarded for participation in a military campaign should also be framed in a dignified and respectful manner. We custom frame military campaign medals and ribbons with other design elements that include: rank pins, distinctive insignias, pins, patches, and other military memorabilia. We also frame them as part of a collection of other objects in shadow boxes and in custom flag display cases. On the right is a custom display for a 4th Battalion 3rd Aviation Regiment customer that features a number of items framed with US Army medals. The design includes flag patches, a 3rd ID patch, a patch for Alpha Company 4th Battalion, 3rd Aviation Regiment (Spiders), a custom nameplate, and a patch for Bravo Company (Black Hearts). Other items included with the military medals are a rosary ring, the ISAF patch, a Combat Action Subdued Badge, and Army Medals. The medal display was constructed with double acid-free/conservation grade mats. The mats are linen—which adds texture to the overall look. The items are mounted onto a tan linen bottom mat. 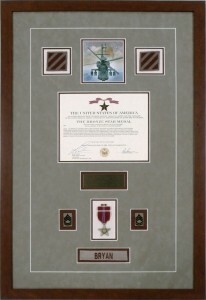 The brown wood frame with metal corner caps in this design is our most popular molding profile for framing small military items such as ribbons and medals. Conservation grade framing materials and techniques were used to complete this custom display case. 99% UV protective glass covers the mats and the objects. Contact us about custom medal and ribbon displays. 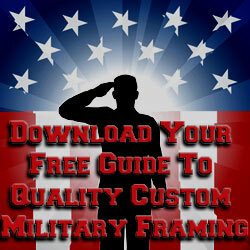 We can modify designs to incorporate military memorabilia related to a military career. Our goal is to safeguard the heirlooms you frame for future generations to enjoy. We invite your questions regarding the creation of a custom medal and ribbon display case. A military career is captured in a medal display case. This custom made medal display offers greater latitude with respect to custom framing options as opposed to an off-the-shelf medal display case. It also offers the functionality of charting a military career. The design for this medal display reflects a long and honorable career for a soldier who advanced through the ranks. This display includes photographs, medals, ribbons, a ribbon rack, badges, patches, aviation wings, rank pins that show the advance from Private First Class to Lieutenant Colonel, insignias, and a custom nameplate. The design for this medal display uses a single acid-free/conservation grade black linen mat. All items are top mounted to the black mat. A standard white v-groove forms a perimeter around the objects in the frame and provides contrast against the brown wood frame. This collection of military memorabilia was framed using conservation grade framing materials and techniques. 99% UV protective glass covers the mats and the items inside the frame. Variations of this design are available. For example, if we frame medals with larger objects, we often use shadow boxes. We are available for consultation to design military medal displays that suit the individuality of either the active duty or retired serviceman or servicewoman. 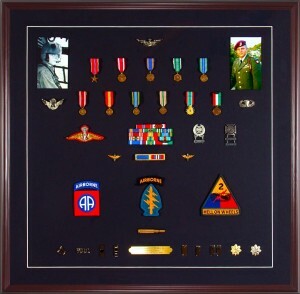 Custom framing military medals and ribbons offer a unique way to preserve heirlooms. When someone receives a military decoration, it usually means they receive a medal or an award. Military decorations or awards take on the outward symbolism of the medal. A military medal signifies an accomplishment that required heroism, some type of meritorious service, or an outstanding performance that is recognition for an achievement. Quite simply, the receipt of a medal signifies the serviceman or woman has gone beyond what is normally expected. For this reason, we believe that military medals and ribbons should be framed in a manner that protects them for display purposes. Displaying a medal or ribbon visually reinforces the action or accomplishment that justly earned an individual recognition for duty and honor. While it’s true that time marches on, a framed military medal or military ribbon rolls back the clock to a moment in time or an event—which should be remembered forever. The recipient of a military decoration reflects honor and duty to country. The best way to preserve these memories for future generations is to custom frame them with memorabilia relevant to the event that earned them the medal. There are a number of military organizations and associations that recognize career military personnel for their achievements. One such association is the MICA—Military Intelligence Corps Association. Their form of recognition is an award with a medallion. The award is known as the Knowlton Award. The Knowlton Award is given in recognition to individuals within the Army Military Intelligence community (http://www.micastore.com/Awards.html) who have made significant contributions promoting Army Military Intelligence. The candidates who receive this award have demonstrated the highest standards for integrity and moral character. They have also displayed an outstanding degree of professionalism and competence. For this reason, we believe the award should be displayed in a custom frame. The frame for this medal includes the award by the Military Intelligence Corps Association on the left, the medallion with ribbon in the center, and the citation for the award on the right. Double acid-free/conservation grade red linen mats were used. An opening for the medallion with a section of ribbon forms the prominent position in the center of the frame. The award and the citation are mounted to acid-free release foamboard. The medallion and ribbon are secured in place by conservation framing techniques. Surrounding the documents and the medallion is a standard white V-groove. A brushed silver-tone frame completes the design. Custom framing of medallions that recognize an individual’s outstanding performance and contribution to the military are available in a number of different styles and display cases. We can vary mat colors and frame styles. We also offer the ability to include other objects inside the frame. Please contact us if you have any questions or need suggestions related to custom framing, medals, ribbons, or medallions. The Army Commendation Medal is awarded to servicemen/servicewomen who have demonstrated sustained acts of heroism or meritorious service. This medal is presented for some actions that require valor in direct contact with an enemy. This is an example of the Army Commendation Medal with the signed award document. 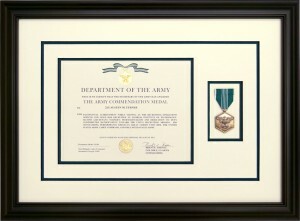 The Army Commendation Medal award document and the medal are framed together in a black wood frame. This Army medal is framed with a design that uses triple acid-free/conservation grade mats. The top and bottom mats are off-white. The middle mat is green and matches the green ribbon on the medal. The medal itself is mounted on an off-white mat. The award document is mounted to a “release” acid-free reversible foamboard. Our signature open V-groove surrounds the award document and the medal. We framed the Army Commendation Medal using conservation grade materials and techniques. This includes using 99% UV protective glass. There are a number of options available for framing the Army Commendation Medal. Some of these options include different mat colors and different style frame profiles. Options are also available that include placing additional objects inside the frame with the medal. Framing military medals and military ribbons is something we’re very experienced at doing. There are a number of options available for custom framing military medals and ribbons. For example, we often frame them in military shadow boxes with objects related to the award. Military medals and military ribbons are also framed with military insignias in a medal display case or in a flag display case. Our section on military flags and displays, and our section on military shadow boxes feature a number of examples with medals, ribbons, and other objects. Framing Army ribbons and Army medals is easily accomplished with custom designs that include the military decoration document. Although a prefabricated medal display case may be appropriate in some instances, we believe customized display cases for military medals and ribbons offers wider latitude for surperior design options. 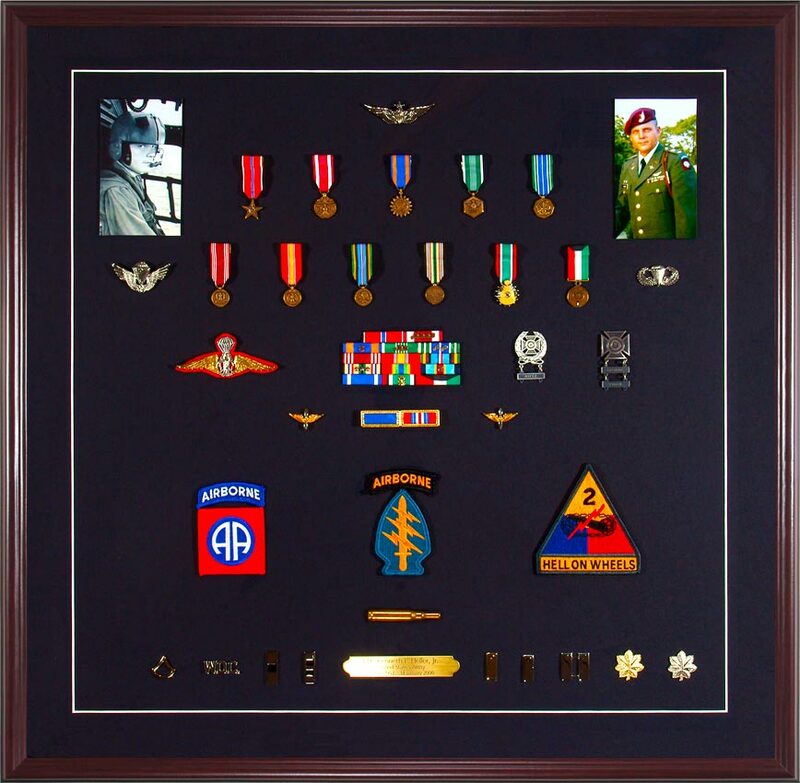 For example, a custom medal display case allows for the inclusion of military objects, documents, photographs, flags, guidons, and military memorabilia with the medals. This is a good example of using items relevant to the award of a medal for the creation of a unique medal display. 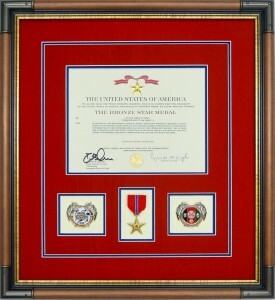 This example features the Bronze Star Medal framed with its accompanying ribbon and award document. 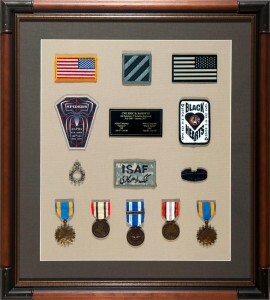 Included in this medal display are 3rd ID patches, a watercolor print, a custom nameplate, rank patches, and a name tape. 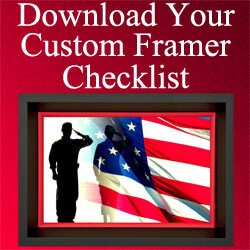 The design for this frame uses triple acid-free/conservation grade mats. The top mat is a green suede mat. The middle mat is a subdued medium brown color. The nameplate, rank patches, and the name tape are attached to the subdued medium brown middle mat. The bottom mat is an off-white. The medal, 3rd ID patches, and name tape are attached to it. The award citation document is mounted to an acid-free “release” reversible foamboard. An open V-groove surrounds the award document and the items in the frame. A dark brown wood frame complements the mats. We frame Bronze Star Medals using conservation grade materials and techniques. This includes using 99% UV protective glass. 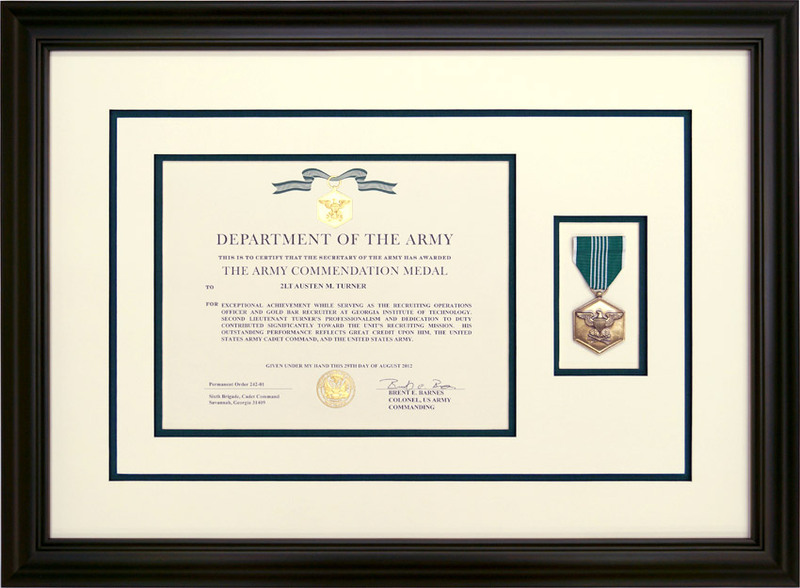 We offer additional options for framing Bronze Star Medals. Some of these options include different mat colors with different style frame profiles. A wide latitude of framing options for medals—including placing additional objects inside the frame with the Bronze Star that reflects the soldier’s accomplishments are available. We welcome the opportunity to design something special for you. Feel free to contact us about designs or pricing. We believe your military medals and ribbons should be preserved as heirlooms and passed down to future generations for them to enjoy and appreciate. Please stop by our shop, or contact us on line with any questions or requests for framing ideas related to your medals and ribbons. The medals we frame are not limited to the United States military. We have created custom medal and ribbon display cases for foreign medals–including Russian medals. Medals that we often frame include sports medallions. These are frequently awarded to runners. Contact us and we will gladly design a display for non-military medals and medallions.